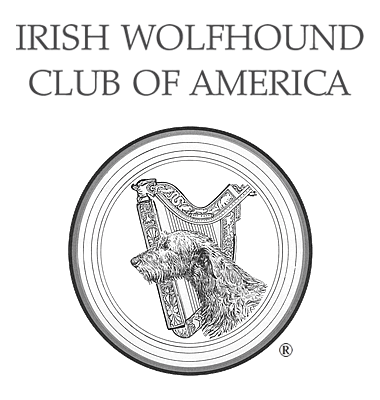 Owner Health Experiences - Irish Wolfhound Club of America, Inc. Whenever your dog becomes seriously ill you are bound to turn first to your breeder and friends in the breed asking: Has anyone else gone through this? How did you handle it? What happened to your dog? Frequently fellow wolfhound owners know more about the breed than some veterinarians, but are not necessarily aware of the most recent developments in veterinary medicine. They may not understand the science but they may better understand their dogs and observe side effects that are not in the literature. The articles in this section represent the recollections of individual owners who volunteered to write them. They should never be used in place of veterinary advice but rather as a basis for questions for your veterinarian or specialist regarding treatments they might suggest. They may not contain all of the necessary details. Your experience may be different. You need to provide a complete medical description of the disease and symptoms. You need to include a veterinarian's diagnosis and recommendations, noting if they were part of a clinical study of a new treatment. You need to provide a detailed description of results, including dates and how you measured the results. Pictures are encouraged. You should provide medical references if available. It is a good idea to review the article with your veterinarian before submission. Please limit articles to no more than 4 pages (about 1100 words). To submit an article for consideration, please send it to the Health and Research Committee Chair. Note that older articles on this site may not meet all of these crieria, but still may contain useful information.